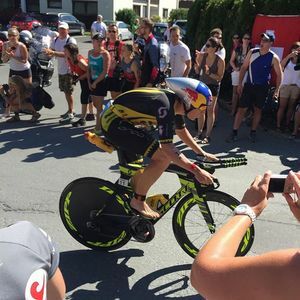 Sebastian Kienle before the race: "It suits my talents because it's this European style of riding—more corners, and switchbacks on the downhill. I've been here for 5 weeks checking it out. Some of the guys ride their trainers indoors all day. Most of the time I'm outdoors and that's where you get the bike handling skills." 2nd and third women, Vodikova and Ryf. Jesse Thomas riding in a group that includes Kienle and Starykowicz so they are no doubt eating away at the gap to the front. The men have hit the first part of the grade. 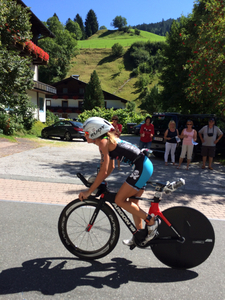 One of our spotters reports that Canada's Magali Tisseyre looks like the big mover on the bike in the women's race. The men have hit the big climb that starts at mile 13 and goes up to mile 21. Before the race, Australian Tim Reed said: "For me, in Australia we don't really have climbs like that. I'm actually pretty nervous about that descent. I'll just have to put all my skills out there on the day and hope I don't lose too much time." 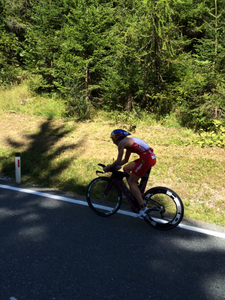 # IM703WCAndreas Dreitz just took the lead from Böcherer. 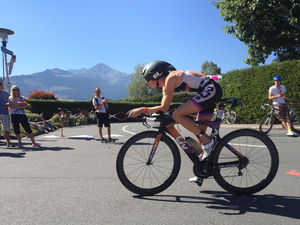 Our top women are within 20 seconds of each other, then there's a 1 minute gap back to 8th place. It's breaking up on the women's side. On the men's side we have 20 guys within one minute. 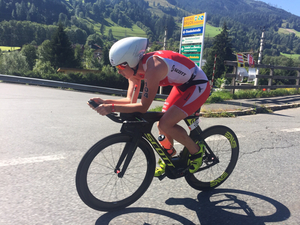 Ryf has long overtaken Brandon and is now leading her charge at the front of the race. Jan Frodeno: "It's great to have a race like this where everyone finally gathers. All season, people have wins here and there, but this is the one that really counts. Hills are not my absolute forte. Heat: it's what we want in a summer sport—I'm happy with the heat." 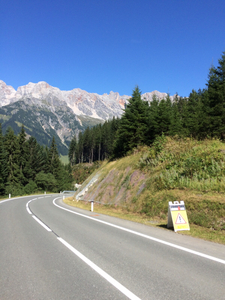 The men just hit the hardest part of the climb. 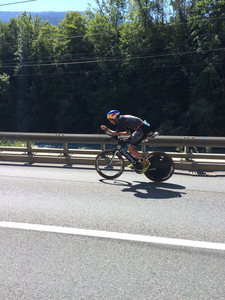 Our spotters report that behind our leaders Dietz and Boecherer, we have Frodeno about 25 seconds back, and Kienle and Butterfield apparently pushing hard to come back. 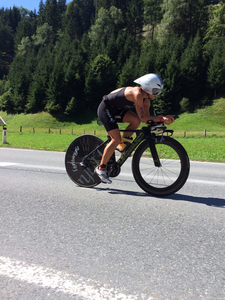 At 34 km, it's Dreitz, and Boecherer, RAelert 1:14 back, Frodeno 1:25 back, then Frommhold, Ciavatella, and Gomez all 1:20 + back. 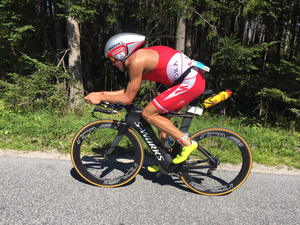 Sebastian Kienle: "We have a lot of chances to use some technical riding skills, which is one thing I like about this venue. I would call it a European riding style." Meredith Kessler before the race: "Win, lose, first place, last place, fifth place, my chi is intact. I'm in a wonderful place I get to share an experience with my husband, those are little things I don't take for granted. The little things make the big things happen." 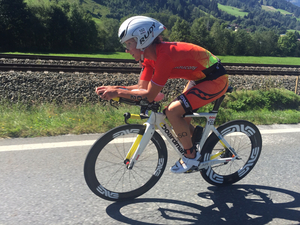 Daniela is slaying this descent, clearly her St Moritz training terrain is giving her an edge right now. Fully tucked in aero, rear up, just flying! 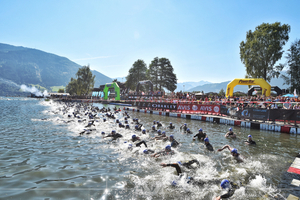 This event brings together the best of short-course and long-course racers, as we see athletes like Gomez and Kay right in the mix, as well as long-course specialists like Kessler and Kienle. Tim Don with 10K to go on climb. Raaelert is telling our spotters it's a hard course and Gomez is saying "ouf!!!" 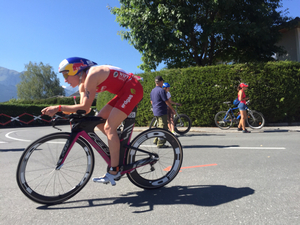 Frodeno has put some time into Gomez behind him, which bodes well for his run. 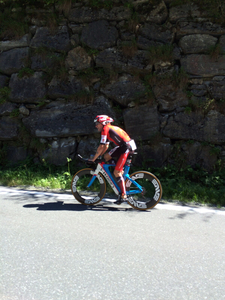 Frodeno said before the race that he wished the course was hillier and more technical. We wonder if he still feels the same way?